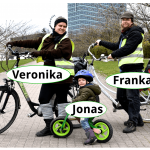 “Velo-City Vilnius” and „Sveikas miestas“ (Healthy city) offer a new alternative to spend your day with your family – ,,Family days on two wheels”. Each family event includes some special lessons on how to ride safely with your family. 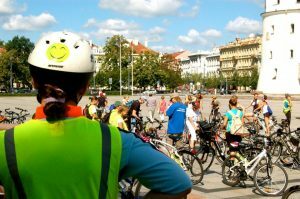 Together we’ll try nice routes in Vilnius and look forward to meet friends on bicycles. e within 2-3 hours (including several breaks). The routes are planned for the participation of children from 3 years. For a common pic-nic and your well-being take water and snacks with you. Meeting place is on the meadow in front of the Open Air Stage in Vingis Park. For the tours’ safety the number of participants is limited to 30 families. 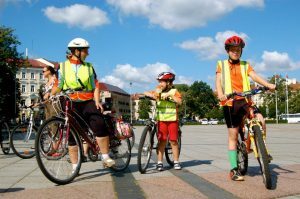 Organisation: „Velo-City Vilnius“, „SPORTLAND” , VšĮ „Sveikas miestas“. Previous PostHow to follow your GPS-Navigation on your mobile phone?Next PostNew bicycle map for Vilnius available for free!